MS Exchange Server is the email server, which is deployed by several industries for the enhancement of email services offered by MS Outlook application. The combination of both Exchange and Outlook brings forth an unbelievable experience to its users. They can connect to one another via emails, calendaring, instant messaging, task scheduler, etc. As per server experts, the database of Exchange is layered with an amazing facility of Extensible Storage Engine (ESE) & an intuitive information store, which is used to place all the emails items along with log files. One of the essential files, which is generated while installing Exchange Server is Priv1.edb & Priv1.stm files. In this blog, we will discuss how to repair Priv1.edb file error. The Priv1.edb database file contains email messages, email headers, heavy attachments, and non-SMTP messages. On the other hand, Priv1.stm files consist of videos, Internet based graphics, audio, and MIME data. 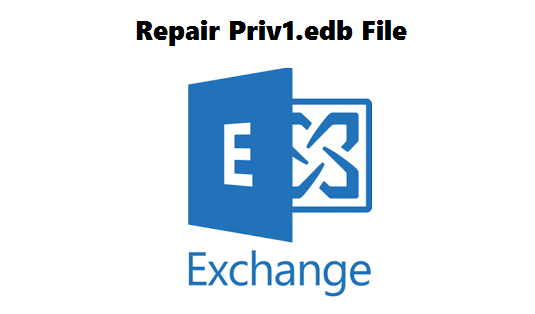 It is possible that while using Outlook email services where Exchange Server saves almost the entire data in Priv1.edb files, Exchange Server gets destruct. Therefore, users should be prepared for the worst conditions and should take backup of all crucial email items. Inevitably, Exchange Server is full of commendable features and provides many collaborative services. However, in spite of the extreme adaptive & rich interface at the Exchange Server client- end, the intrinsic ESE and information store are fragile. This means any inconsistency in the checksum value calculation, page file reading, or shutdown process may result in errors and corruption like situations in Exchange. This corruption at the file, information store level, jet engine always affects Priv1.edb files. Firstly, it is suggested to execute the process of Exchange Server backup to avoid the situation of loss of any email items. Similarly, before beginning the offline defragmentation, verify the Exchange Server Priv1.edb space by using the following command: eseutil /ms “c:\program files\exchsrvr\mdbdata\priv1.edb”. To repair Priv1.edb & Priv1.stm database files, you need to type in the following command: ESEUTIL /p “c:\program files\exchsrvr\mdbdata\priv1.edb” /Se:\exchsrvr\mdbdata\priv1.stm /Te:\tempdb.edb. Once you have used the ESEUTIL program to redevelop the ESE & information store, you should end the process of recovery by invoking the ISINTEG utility & detect further errors. Type in isinteg –s dc –test folder, in the command prompt, &verify the accessibility of Priv1.edb files. All the above-mentioned steps will repair Priv1.edb corruption and bring Exchange functionalities on the right tract. However, sometimes it becomes impossible to repair corrupt Exchange database file with the help of inbuilt ESEUTIL & ISINTEG tools. In such cases, users go for a third party utility. EDB Mailbox Recovery is one such program to repair Exchange database file. With the help of this tool users can scan, recover and preview damaged or corrupted exchange database mailboxes. The tool supports the scanning of both Priv.edb & Pub.edb file of Microsoft Exchange server. With the help of this software, users can repair priv1.edb exchange 2003, 2007, 2010, 2013, 2016. Moreover, this software can be accessed with all versions of Windows Operating System. Like any other server Exchange Server, files are prone to corruption. Therefore, after considering the importance of Priv1.edb files, we have discussed two methods to rectify private EDB file error. One is manual approach and the other one is an expert solution. Users can opt for any of the methods as per the need to repair Priv1.edb. Copyright © 2007-2019 FreeViewer Software All Rights Reserved.